Since sinks get a lot of daily use, it makes sense that they would occasionally need plumbing repair. This is where Parker-Arntz Plumbing & Heating, Inc. can help you. Thankfully, a plumbing technician can help you find the cause of a leaky faucet so you can save money in the long run. Our skilled plumbers are here to assist you to make sure that your faucets are all working properly. Continue reading to learn the 3 signs you need bathroom faucet repair. A dripping faucet can cost you money in the long run if it isn’t repaired by a plumber. While a leaky faucet may not seem like a high priority, each drop of wasted water accumulates over time. 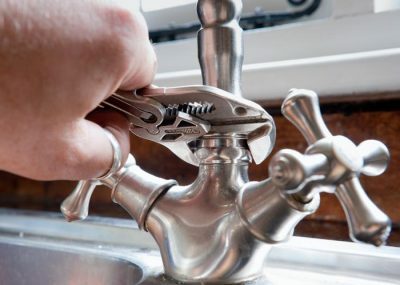 The sooner you schedule leaky faucet repair, the less water you’ll waste. Sometimes a dripping faucet can be a sign of a larger problem. If this is the case, don’t wait until you need an emergency plumber to call. Unresolved plumbing problems can lead to water damage and mold if not fixed as soon as possible. For example, a dripping faucet could be a sign of high water pressure, which adds stress to your entire plumbing system. Does your sink drain slowly? A clogged bathroom sink can make water drain slowly so it appears to be standing. Most of the time, a clogged sink drain can be fixed with a pipe snake or drain cleaner. If this doesn’t work, you’ll need to call a licensed plumber as soon as possible. A break in the pipe could be stopping water from draining properly. When you own a home, it’s important that you fix plumbing problems as soon as possible. A clogged sink is more than just an inconvenience—it can also cost you more money in the long run than if you had just called us in the first place. Turn on your bathroom faucets and watch how much water freely flows. If only a trickle of water is able to escape, you most likely have low water pressure. Low water pressure not only makes it difficult to use the sinks in your home but can be a sign of clogged pipes. A pipe bursting can also lead to low water pressure, as well as water damage. If you suspect your home has clogged pipes, you’ll need to contact plumbers as soon as possible. A technician with experience in residential plumbing will be able to find the cause of low water pressure so you can avoid expensive repairs. Contrary to popular belief, high water pressure isn’t preferable to low water pressure. High water pressure adds stress to residential plumbing and can decrease the lifespan of dishwashers and other appliances. Signs of high water pressure include leaky faucets, banging pipes, and running toilets. Any of these warning signs should prompt you to call our plumbers. We’d be more than happy to inspect the plumbing in your home, troubleshoot problems, and find a solution. Our licensed plumbers offer a range of plumbing services for your home. We are proud to serve West Michigan. To request your quote for plumbing repair or maintenance, call Parker-Arntz Plumbing & Heating, Inc. at (616) 225-9150.